TORONTO – Fura Gems has launched the Provenance Proof Blockchain designed to promote transparency in the coloured gemstones industry. The program was launched by Gubelin Gem Lab with Everledger at the Tucson, Ariz. gem show. 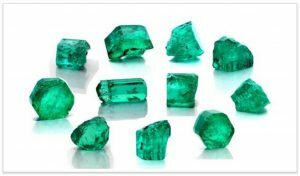 Emeralds from Fura’s Coscuez mine in Colombia were used to test the technology. The Provenance Proof Blockchain is the first such system for coloured gems, although blockchains are already in use by diamond and gold producers. The blockchain provides a shared ledger that creates a verifiable and tamper-proof logbook of transactions throughout the supply chain that can be viewed by all the authorized stakeholders. Fura intends to combine the blockchain with its Emerald Paternity Test, which acts as a physical marker that helps determine where stones are mined and every step they undergo on the way to market. The tracers are applied as DNA-based nanoparticles. Information about the Provenance Proof Blockchain are available at www.ProvenanceProof.io. Also visit www.FuraGems.com.